Hi, friends, and welcome to this lesson! When a person carefully reads the first two chapters of Genesis, he or she often thinks of many questions. God hasn't revealed the answers to everything we might like to know, but we can help you understand the answers to many of the common questions. The primary purpose of this lesson is not to show the many things wrong with the theory of evolution, although this lesson does refute that theory. This study is addressed primarily to those who already believe that God created all things. We hope this lesson will not only be beneficial to you personally but also help prepare you to answer the questions and arguments of others who may be skeptical or confused. What does the Bible reveal about how, when and why God created the universe? The following story from Revelation 4 is part of the vision that God gave the apostle John of God's temple in heaven. It emphasizes how God deserves our utmost reverence and worship for being the Creator of all things. John wrote, "Immediately I was in the Spirit; and behold, a throne set in heaven, and One [God] sat on the throne" (Revelation 4:2). "In the Spirit" means receiving divinely inspired visions by which John was transported in his mind's eye. John saw a vision of God in all His glory! John then described the awesome angelic beings that are in attendance at God's throne. John saw "twenty-four elders" and "seven Spirits of God" and "four living creatures," all worshipping God. Notice what the 24 elders say as to why they are worshipping God: "The twenty-four elders fall down before Him who sits on the throne and worship Him who lives forever and ever, and cast their crowns before the throne, saying: 'You are worthy, O Lord, to receive glory and honor and power; for You created all things, and by Your will they exist and were created'" (Revelation 4:10-11, emphasis added throughout). Controversy Between "Young Earth Theory" and "Ancient Earth Theory"
According to many scientific dating methods, this planet earth is many millions of years old. However, from biblical chronology we can calculate that the span of time from the creation of Adam and Eve to the present is about 6,000 years. As a result, most people who believe the Bible is divinely inspired are divided into two main groups based on their explanation for the apparent contradiction. The "young earth" group generally believes that all of God's creation took place only 6,000 years ago. Many of them believe that God made things to appear to be older but that one must believe in a 6,000-year-old earth if he or she believes that the Bible is the infallible Word of God. Many "ancient earth" theorists believe that some parts of the creation account weren't meant to be taken literally. 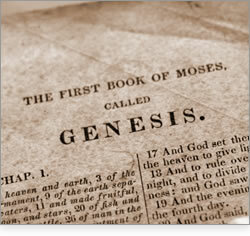 Many believe that the "days" in Genesis 1 are symbolic of long eras of time. But there are unanswered questions with both main theories. But for nearly 2,000 years, various scholars and other Bible students have proposed another explanation that is in harmony with both the Bible as a whole and the predominant view of scientists of an ancient age of the earth. This explanation involves what some people call, sometimes disparagingly, the "gap theory," which shows that the Bible allows for a long time interval between verse 1 and verse 2 of Genesis 1. In the New King James Version, verse 2 says, "The earth was without form, and void." However, the Hebrew word translated "was" (hayah) is translated "became" in Genesis 2:7, 9:15 and 19:26. Translating hayah as "became" in Genesis 1:2 puts the Bible in harmony with science and history. You see, Genesis 1:1 is speaking of God's original creation of the earth many millions of years ago. Genesis 1:3 begins the account of God's re-creation of the earth after it had experienced great destruction. It's not logical to think that God would create the earth "formless and desolate" as the Good News Translation translates Genesis 1:2. We would expect God to create everything with beauty and perfection. "God is not the author of confusion" (1 Corinthians 14:33). In fact, Isaiah 45:18 tells us, "For the LORD is God, and he created the heavens and earth and put everything in place. He made the world to be lived in, not to be a place of empty chaos" (New Living Translation). The Hebrew word here translated "empty chaos" is tohu, the same word translated "without form" in Genesis 1:2. So what happened? Long after the original creation, a violent cataclysm occurred that caused the chaos. The event that caused the surface of the earth to be largely destroyed is explained in our booklet Creation or Evolution: Does It Really Matter What You Believe? You can access it online or request a free copy. To summarize, God created the earth with exquisite perfection, but a cataclysm brought destruction. We don't know how many years there were between the time of God's creation and that cataclysm, nor do we know how many years there might have been between that cataclysm and the re-creation described in Genesis 1. Notice Psalm 104:30: "You send forth Your Spirit, they are created; and You renew the face of the earth." What is described beginning with Genesis 1:3 is God's renewal of the earth and its creatures. So, Genesis 1 and 2 should be understood as literally true. This planet is indeed very old, but most of the flora and fauna we have today, as referred to in Genesis 1, was created about 6,000 years ago. And human beings began at that time with God's creation of Adam and Eve. Some people have thought that the creation accounts in Genesis 1 and 2 contradict each other. For example, Genesis 1 describes animals being created before Adam, while Genesis 2:19 could be read as if Adam had been created before the animals. But the Bible never contradicts itself, because it was inspired by God. Genesis 2:19 doesn't mean that God created Adam first and then the animals. The correct chronological (day-to-day) sequence of events is stated in chapter 1 but not in chapter 2. The content of chapter 2 is a complement and supplement to chapter 1. God means for us to combine the content of the two chapters to get a more complete picture of what happened and why. "To what were its foundations fastened? Or who laid its cornerstone, when the morning stars sang together, and all the sons of God shouted for joy?" In this context, "stars" and "sons of God" refer to angels (Job 1:6; Isaiah 14:12-13; Revelation 1:20). They had to be created before the earth was created, because they were celebrating at the time of earth's creation. What about the demons? The demons were originally angels. When they later rebelled against God and became evil, they became known as demons. They are led by Satan. When did the dinosaurs and other prehistoric creatures live? The earth was [became] without form, and void; and darkness was on the face of the deep. And the Spirit of God was hovering over the face of the waters. The age of the dinosaurs was pre-Adamic. As explained above, a cataclysm apparently destroyed the animals and vegetation on the earth, including the dinosaurs, long after God first created the earth (see "What does the Bible say about dinosaurs?"). How can we know if the "days" in Genesis 1 are 24 hours in length? Then God said, "Let there be lights in the firmament of the heavens to divide the day from the night; and let them be for signs and seasons, and for days and years; and let them be for lights in the firmament of the heavens to give light on the earth"; and it was so. Then God made two great lights: the greater light to rule the day, and the lesser light to rule the night. He made the stars also. God set them in the firmament of the heavens to give light on the earth, and to rule over the day and over the night, and to divide the light from the darkness. And God saw that it was good. The Bible never contradicts itself, although we humans often lack total understanding of it. The sun had to exist long before the creation week described in Genesis 1. The solar light and heat would have been necessary for the existence of the flora and fauna during the age of dinosaurs. In Genesis 1:16, the Hebrew word translated "made" (asah) can be translated several different ways, including "had made," "appointed," and "set." We can't be sure which translation conveys the exact meaning that God intended. "Now we come to the fourth day: 'Then God said, "Let there be lights in the firmament of the heavens to divide the day from the night"' (verse 14). On this day the atmosphere is further cleared so that from the observation point of the earth's surface, the sun, moon and stars are now clearly distinguishable in the sky. 'Let there be' is not a statement of the initial creation, but a statement of appearance. This passage tells us that these celestial objects were allowed to be visible so that they could serve people as markers of signs, seasons, days and years." And He [Jesus] said to them, "The Sabbath was made for man, and not man for the Sabbath." God "sanctified" the seventh day by resting on it. Sanctify means "to set something apart as sacred or holy." In doing this, God made the seventh day of every week, throughout time, a weekly holy day. Later on, it became known specifically as the "Sabbath" (Exodus 16:23-30). Since God defines a day as extending from sundown to sundown, the Sabbath extends from Friday sundown to Saturday sundown. He made it for the benefit of "man"—all humanity—not just for the Jews, as some people claim. It is a day for all humanity to worship our Creator and celebrate His creation (Exodus 20:8-11). Did God create human beings with a soul inside them? A human being is a soul; he does not have a soul residing inside him. The Hebrew word translated "soul" is nephesh, which refers to any air-breathing creature. It is translated "creature" in Genesis 1:24; 2:19; 9:10, 12, 15 and 16. Notice that in the New King James Version of Genesis 2:7, it is translated "being." The idea of an immortal soul inside each person is not biblical, but is actually of pagan origin. A soul is mortal—it can die and does die (Ezekiel 18:4). Not until the resurrection will we have immortality (1 Corinthians 15:52-54). Why did God make Eve from one of Adam's ribs? And Adam said: "This is now bone of my bones and flesh of my flesh; she shall be called Woman, because she was taken out of Man." God made Eve from Adam's side so they would think of their marriage as being united as "one flesh" and strive for marital unity, harmony and love (Genesis 2:23-24). And God intended for marital relations to enhance and strengthen that oneness (1 Corinthians 6:16; 7:1-5). What is meant by God creating man "in His own image"? "Likeness" and "image" literally mean resemblance. However, greater meanings are implied, since man was made to be far superior to all other creatures, having Godlike qualities, even being able to have "dominion," or rule, over all other creatures. As we progress through the Bible, we learn more and more about humanity's awesome potential and purpose. In the New Testament, we learn that God's purpose for us is to be conformed to the spiritual character image of Jesus Christ (Romans 8:29; 1 Corinthians 15:49). For a much more thorough explanation about what it means to be created in God's image, please read our inspiring booklet What Is Your Destiny? It's free of charge. The first and second chapters of Genesis 1 are jam-packed with important information. Please carefully read these chapters and see what other questions come to your mind that are not answered in this lesson. Some may be answered in our reprint series Answers From Genesis. If not, feel free to write to us with your questions, and we'll do our best to answer them.